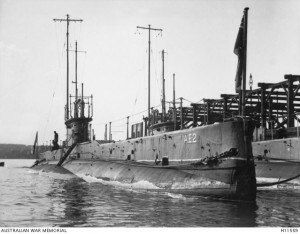 Lieutenant-Commander Henry Stoker is ordered to navigate the Australian Navy submarine AE2 safely through the Dardanelles Strait to the Narrows at Chanak. The submarine runs aground on Sangrada Point at the entrance to the Dardanelles. Commander Stoker successfully frees the submarine and returns to Mudros for repairs. The poet Rupert Brooke, dies of blood poisoning on a hospital ship anchored off the Greek coast while awaiting deployment in the Allied invasion of the Gallipoli Peninsula. Brooke’s early war poetry expressed an idealism that would be at odds with poetry published later in the conflict. First Lord of the British Admiralty, Winston Churchill, penned Brooke’s obituary, published three days later in The Times. This entry was posted on April 23rd, 2015.